The complete guide to Wine Grapes focus on the main grapes used to produce the wines usually covered in The Wine Cellar Insider from Bordeaux, The Rhone Valley and California. The Wine Grape Guide explains how each and every wine gets its flavor profile from a combination of the grapes used to produce the wine, the soil and weather patterns where the fruit was grown and the choices exercised by the winemaker. The right climate, terroir and soil for each grape variety is needed for the fruit to ripen and develop its full potential. It is no coincidence that all the great vineyards are planted in similar latitudes of 30 to 50 degrees south and 30 to 50 degrees north. The correct soil and the terroir the grapes are planted in is paramount to their quality. The best soils are usually poor for most living things. They have very little organic material and are often made from rocks, sand, clay and limestone. While the soil types vary, the best terroirs all offer natural drainage in wet periods and the ability to retain moisture in warm, hot and sun drenched conditions. The ability to regulate the water to the vines while allowing the vines to ingest nitrogen, iron and other natural elements is the engine that drives the grapes to phenolic ripeness. The links on the left side of page bring you to full detailed on all the major grape varieties used to produce the wines you read about in The Wine Cellar Insider. The world’s vineyard continue expanding to meet the demand of thirsty consumers. Regions that were not previously producing wine have become popular, for example China is now a massive wine producing country. The most popular grapes have changed over the years as well. Today, for red wine. Cabernet Sauvignon and Merlot are the world’s most widely planted grape varieties for red wine. Chardonnay is now the most widely planted white wine, grape variety. While the specific rankings of which grapes are the most popular, it’s interesting to note that leading grape varieties continue becoming more popular, while lesser known grape varieties continue falling from favor. For example, take the 35 most popular wine grapes, in 2000, they occupied 59% of the world’s vineyards. By 2010, they increased their hold, rising to 66%! It’s not just that the same grape varieties that remain popular, so do the countries that plant them in their vineyards. As of 2010, France, Italy, Spain and the United States accounted for 60% of the world’s vineyards. Overall red wine continues gaining in popularity, while the production of white wine keeps slipping. Between 2000 and 2010, the production of red wine grapes jumped from 49% to 56%. Although those percentages continue to change slightly. In 2015, red wine grapes continued its dominance. In 2015, 54% of all wine produced was red, 37% and Champagne and the remaining 9% were Rosé. Here’s another interesting fact for you. China now has the deepest plantings of red wine grapes at 86%, while Luxembourg is the country with the highest percentage or white wine grapes at 92%! All grape varietals share the same growth cycle. Grape vines rest during the winter months. They are basically dormant. In cold European climates where frost and snow can injure or kill a vine this is a good thing. Winter rains also help replenish the soil water tables that could have dried during the summer and fall months. In the spring, the grapes come alive with bud burst which springs into action with new growth on the leaves and shoots. This is followed by the all important flowering period that takes place as the official start of the summer kicks in. This is time when growers get an idea about the yields they might end up for the vintage. If the harvest looks to be large, growers conduct a green harvest to reduce the yields and concentrate the grapes. 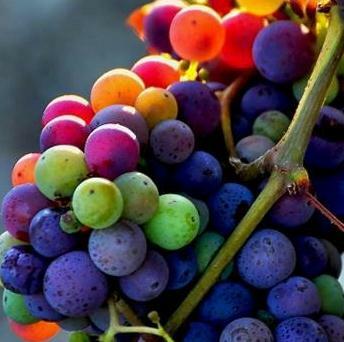 This is followed by veraison, which is the French term for when the grapes change color. At this point, it’s hurry up and wait, hoping the grapes develop the needed amount of phenolic ripeness and sugar levels for harvest. The Wine Grape Guide also provides the best tips of wine and food pairings that are easy to follow and affordable too. Because each grape is different, you’ll find different ideas for food and wine pairings for every type and style of wine grape we cover. The type of grape planted in the vineyard has the largest bearing on the flavors and characteristics found in a wine. Like wine, each grape variety offers its own, unique, flavor profile. While any grape can be planted in any region, today, vintners are more aware than ever, that the type of soil, exposure and weather patterns will affect the ability of the fruit to achieve the desirable level phenolic ripeness the grower is seeking. Wine comes in all shapes, sizes and colors. In America, wine is produced in all 50 states! Wine is made in more countries than I can count. In fact, there are thousands different grape varieties of which the exact type of grape and term we are concerned with is, “Vitis Vinifera,” which refers to vines specifically used to produce wine. However, most of the worlds popular wines are produced from closer to 100 unique varietals. The most popular grapes, especially the noble varieties have been used to produce wine for centuries. Noble grape varieties are grapes that can produce a world class wine without the need of blending. To produce wine, most vines need a minimum of 3 to 5 years before they can produce wine. However, many regions prefer using older vines. For example, in Bordeaux it is common for growers to wait 20 or more years at the top estates before using the fruit for their top wine. The Wine Grape Guide will focus on the main types of grapes that are used to produce red and white Bordeaux ; Cabernet Sauvignon, Merlot, Cabernet Franc, Petit Verdot and Malbec for the red wine along with Sauvignon Blanc and Semillon for the white wine. As you have seen with all the links on the left side of the page, the Wine Grape Guide looks at Syrah, which is used in Cote Rotie and Hermitage in the Northern Rhone as well as in other countries along with Grenache and Mourvedre, the other most popular grapes used in Chateauneuf du Pape, in the Southern Rhone Valley. The Wine Grape Guide will cover the Burgundy varieties for red wine, Pinot Noir, and Chardonnay for the white wine. The Wine Grape Guide will also discuss the single grape that is most identifiable as a California wine varietal, Zinfandel. All the red and white wine grape varietals mentioned are used in the production of California wine, as well as in wines from a myriad of other countries will be covered in the Wine Grape Guide.